The stalemate continues on the reopening of the Darjeeling Rangeet Valley Passenger Ropeway service suspended a week ago by the district magistrate citing non-furnishing of a no-objection certificate by the operating company. 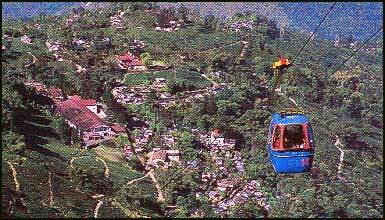 A major tourist attraction, the ropeway service was closed on May 26 by the Darjeeling district administration after the West Bengal Forest Development Corporation (WBFDC) lodged a formal complaint stating the operator, Conveyor and Ropeway Services Private Limited (CRSPL), had failed to furnish the mandatory NOC from the state PWD department. The ropeway is a joint venture of the CRSPL and the WBFDC and the former is responsible for maintaining the service and also providing the NOC. Officials of the CRSPL were tight-lipped about the possibility of an early reopening of the ropeway service, but a senior authority who did not wish to be named, said, “We were asked to submit a technical audit after reports of sagging of the lines between two trestles were brought to light. We have already prepared a technical report and only require the signature of the PWD principal secretary and the chief engineer.” The official also said this could take some time as the PWD principal secretary is on medical leave while the chief engineer had just retired. “The principal secretary has not come to office, while there is a new chief engineer now, who we will have to meet,” the CRSPL official said. The CRSPL had hired the Industry-Institute Partnership Cell, Indian Institute of Engineering Service and Technology, Shibpur, which had conducted a field inspection from September 11-13, 2015 which was then submitted to the state PWD. The PWD had issued an NOC on September 22, 2015 stating it had not objections for commercial use of the DRV ropeway service for one year, from September 14, 2015 to September 13, 2016. Even so, the PWD department had said the overall condition of the ropeway system should be monitored regularly. According to the WBFDC, it is mandatory to renew the NOC every year and it has to get the recommendation of the state PWD department.